There has recently been some confusion surrounding the question: “how do I get into the Olympics in the sport of speed skating?”. Not helping in any of this is the somewhat misleading naming convention of “qualifying times” and “eligibility criteria”, not to mention the horrendously poorly-organised website of the International Skating Union, the sport’s governing body. With the first world cup of the Olympic season upon us, I’ve decided to try to clear things up a little bit. There are five Olympic distances for each of the male and female categories. 500m, 1000m, 1500m, 5000m, 10000m for men, and 500m, 1000m, 1500m, 3000m, and 5000m for women. Then there’s the team pursuit which is about 2400m for women, and 3200m for men. In each of the distances of 500m, 1000m, and 1500m there are 40 available places for the men’s events and 36 available places for the women’s events. In the 3000m for women and 5000m for men, the number is 28, and in the 5000m for women and 10000m for men, the number is 16. Why the difference? Sexism. That’s why. In addition to all of this, there is a maximum number of people per country in each event. For the 500, 1000, and 1500, that number is 4, and for all the other distances, it is 3. There is also a maximum number of competitors in total that each country may enter, and it is 10 women and 10 men. There is also a maximum number of competitors for speed skating for the entire Olympics, which is something like 180. So within those constraints, we have to determine who gets to go to the games. One of the first things you will hear about are the “qualifying times”. This is a poor choice of words because achieving those times does not guarantee that you will qualify for the games. In fact, I can say with some confidence that if you just slip under those times, you will NOT qualify for the games. Achieving a qualifying time does one thing and one thing only – it makes you eligible to go to the games, that is, it is a bare minimum requirement. The qualifying procedure takes place over the first world cups of the season. In this case: Calgary, Salt Lake City, Astana, and Berlin. During these world cups, all the distances will be contested and skaters will collect points, and record times. At the end of these competitions (they run until mid-December) the “Olympic List” will be determined. In the 5000m for example, the first 16 ranked skaters on the points table will earn the first 16 places to go to the games. However, they do not earn those places on an individual basis – they earn those places for their country. If a country has earned more than 3 places, their 4th, 5th, etc. ranked skaters will be struck from the list and the next skaters are moved up until the list is filled. The remaining 12 places are filled according to time ranking, again making sure that no country has more than the maximum allowable number of skaters. When the number of places per country in each event is decided, each country’s skating federation is notified, and then the countries are allowed to fill those places with whomever they wish (they may even choose not to use an allocated place, in which case the next skaters are all moved up a spot). The only criteria is that the people who get the places have achieved a “qualifying time” at a suitably-major competition (various criteria apply for timing equipment, and standing of officials). 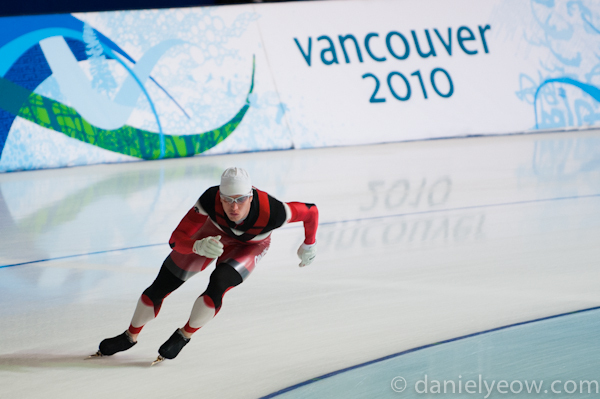 Ordinarily, a country will fill those places with the same skaters who earned those places, but in some countries, particularly the bigger, stronger skating countries, like the Netherlands, Canada, and Japan for example, a separate trials is conducted in December or January to determine who gets to fill those places. So basically, in our example of the 5000m, the people who get to go are the top 28 skaters in the world over that distance, subject to the constraints of each country only being allowed to send a maximum of three skaters. At the last Olympics, 4 Dutch skaters, 1 Norwegian skater, and 2 skaters from the US missed out because of this rule, so in theory the “last qualifier” was the 35th-ranked 5000m skater in the world – still no slouch. In 2010, the “qualifying time” for the 5000m was 6:35. The time of the slowest skater who qualified was 6:25. The slowest time on the reserve list (which exists in case a skater pulls out prior to the games) was 6:30. So I think you can see what I mean when I say that calling 6:35 a “qualifying time” might be a little misleading. At the last Olympics, in every single event, the time of the last qualifier was consistently significantly faster than the set “qualifying time”. This year, the qualifying time is 6:33, and there is every reason to believe that the actual cutoff time will be significantly faster than it was 4 years ago – it always gets faster. As if this isn’t complicated enough, in the case where a country has earned no spots in an event, if one of their skaters has achieved a top 16 place (or top 8 in the men’s 10k, or ladies 5k) in either the previous year’s world single distance championships, or world cup ranking, then they may have the last allocated place at the expense of the last qualified skater (unless that skater also fulfils that criteria, in which case the second-to-last qualifier will lose their place). This is the reason that Joshua Lose of Australia lost his 28th place qualifying spot to Roger Schneider of Switzerland at the Vancouver Games. So to go to the games, one must first qualify for World Cup events. Those qualifying times, while not as tough as for the Olympics, are not easy to achieve. After that, one must either be in the top-half of the world cup points table, or achieve a time within the top 40, 36, 28, or 16 of the world, depending on the event. It should be noted that in order to be in the first half of the world cup points table, one must consistently start in “A” group, which consists of the top 20 skaters. To earn a place in A group, one must win B group in the previous world cup. In order to set a fast enough time to qualify for the Olympics, one must skate it at either of the Salt Lake City or Calgary world cups, since those are at altitude and are thus conducive to faster times. If one is the kind of skater who is good enough to set an Olympic qualifying time (i.e. a time which is fast enough to qualify, not an official “qualifying time”) at a non-altitude venue, then one is not a skater who has to worry about Olympic selection. I have attached PDFs of the “Olympic Lists” for the Men and Women from the 2010 Vancouver games for your perusal. If anyone has any questions or comments, please feel free to post in the comments section, or to contact me directly about it. I understand that, but still confusing…(so what is priority? 1-st best place, 2-nd best time, sum of a few distances and so on…..)Where can I find it quickly? Which communication number? it’s not in an ISU Communication, it’s in the rules. Last updated at the congress of 2012. If the total number of skaters exceeds the number specified by the IOC, then the last qualified skater in the men’s 500m is eliminated, then the last qualified skater in the men’s 1000m, then 1500m, then ladies 500, 1000, 1500 etc. until the number is correct. Thanks Daniel…. probably I have got it….